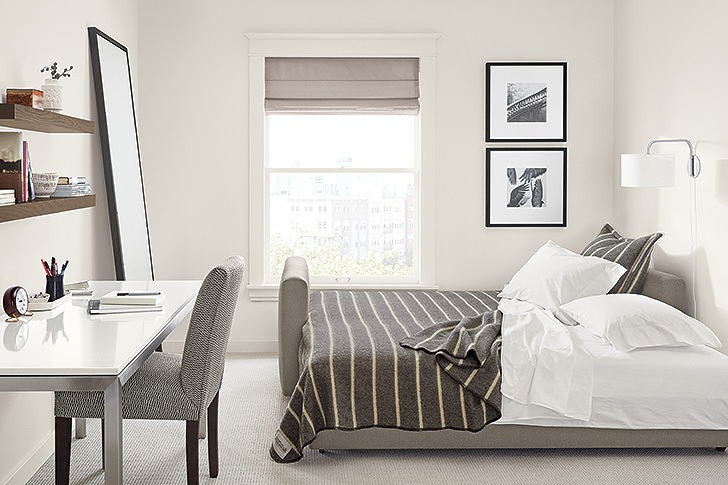 Bedrooms are meant to be sanctuaries of rest and relaxation, so they should look the part! With the right furniture, decor and these helpful small bedroom styling tips, the smallest bedroom can feel warm and fresh. Let’s examine a few key rules for decorating small bedrooms so they feel less like cold caves and more like cozy nests. Freshening up small bedrooms with lighter, brighter colors is the best tool you have for creating a welcoming, relaxing space. Lighter colors are easier to digest and make spaces feel more open, airy and clean, which is especially important when decorating a small bedroom so it doesn’t feel cramped. Optimizing visual floor space is essential in small spaces, so don’t be afraid to get critical when deciding what gets floor space and what needs to go. Whether it’s your bed, dresser, nightstand or desk, furniture that has space between its base and the floor looks visually lighter, which is ideal for small bedrooms. 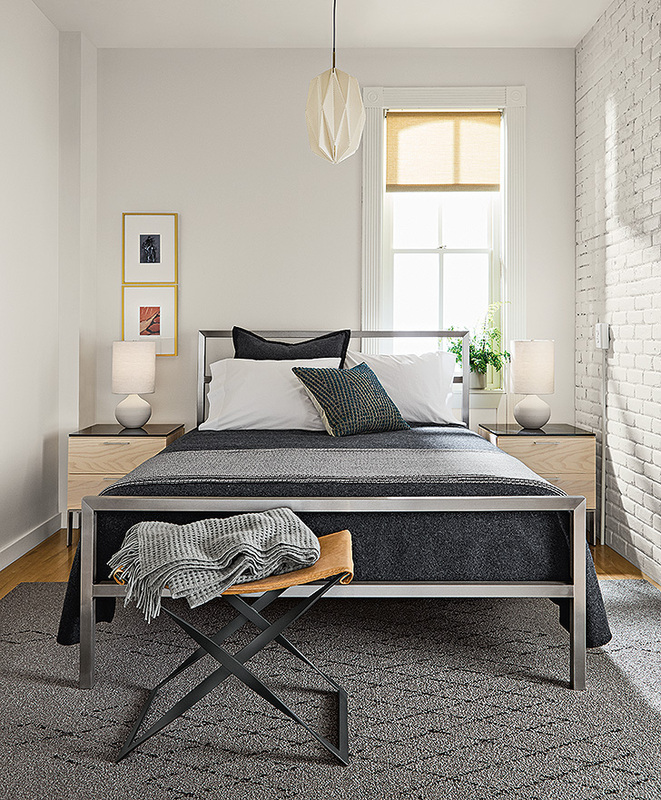 Opt for smaller-scale bed frames, dressers, and nightstands that are up on legs—your space will feel surprisingly more open. While you’re at it, consider switching to lighting that’s suspended or has a thin base. The light you experience before bedtime can set you up for a better rest, and the light you experience during the day can help you feel awake and alert. Soft, warm lights are great for relaxing before bed, while cooler, natural light is great for waking up. For this reason, consider warmer bulbs in your nightstand lamps which you use when dozing off, and cooler, brighter bulbs in a floor lamp or overhead light, which you use when picking out an outfit in the morning. Great lighting will make you feel as good as the room looks. Mirrors and windows are easy ways to achieve dimension in small spaces. For small bedrooms, consider a tall leaning mirror for a stylish, modern way to select your outfit, and a mirror on your dresser or desk for fine tuning. For windows, find window treatments that keep your room dark at night and are easy to open during the day to let in more light.